Samsung introduced four new mid-range smartphones under the Galaxy brand namely the Samsung Galaxy Grand, Galaxy Win, Galaxy Core, and Galaxy S Duos. These new smartphones complement high-end models as they are packed with advanced features but entailing more budget-friendly prices. The Samsung Galaxy Grand features a 5-inch screen and is built with an 8-megapixel rear shooter with LED flash. Similar to other Galaxy smartphones, it has a multi-window feature that lets users multi-task. It is equipped with dual-SIM capability. It is priced at PhP 16,990. 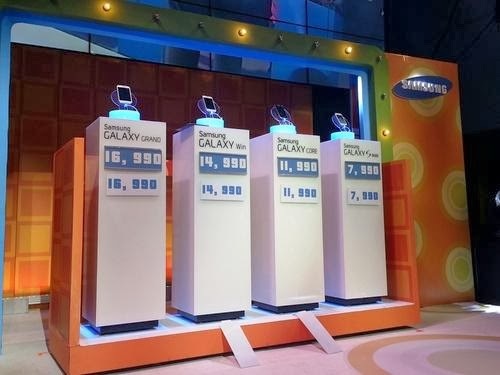 The Samsung Galaxy Win is the only unit in this lineup with a quad-core CPU. It runs on a 1.2 GHz quad-core processor while sporting a 4.7-inch screen. It features Motion UI (Shake & Turn to Mute) and SMART alert. It comes with a price tag of PhP 14,990. The Samsung Galaxy Core comes with a sleek design with its silver-lined bezel. This 4.3-inch smartphone has a 5-megapixel rear camera with LED flash and a VGA front camera, an 8GB internal storage and a microSD slot, and a slew of other features such as Motion UI (Shake & Top to Bottom), Smart Stay, Smart Alert, Best Shot, and S Voice. It has an SRP of PhP 11,990. Finally, the Samsung Galaxy S Duos is a 1GHz smartphone that runs on Android 4.1 Ice Cream Sandwich. It has a built-in organizer, a photo and video editor, and document viewer; and also has a card slot for a microSD to expand its capacity up to 32GB. It also has a 5-megapixel rear camera and a VGA front camera. It has dual-SIM capability and tagged at PhP 7,990.